The health benefits of parsley are quite amazing and it’s a superfood well worth eating a lot more of, particularly if you’d like to live longer and lower your risk of serious diseases like cancer, arthritis and heart disease. If you’re young and care more about your appearance, parsley can help here too, with powerful nutrients for better skin, preventing acne and encouraging healthy hair growth. Parsley is also a very beneficial digestive aid, detoxifier and internal cleanser, immune booster and can even make you smell better. Both curly and Italian parsley have very similar nutritional properties and there’s definitely a lot more to this herb than just garnish. Here are 11 important health benefits that show just how good parsley is for you and why you should have it in your meals more often. Parsley can stimulate appetite and improve digestive processes within your body. It is full of enzymes that aid in the proper breakdown of food during digestion. It is also rich in a variety of different vitamins, minerals and other nutrients that are beneficial for the absorption and proper utilization of the food you eat. 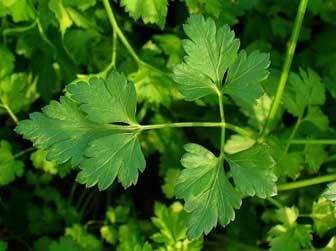 Compounds in parsley cleanse and detoxify the kidneys, liver and bladder. The herb is also a natural diuretic that can help to relieve water retention and bloating. Parsley tea is a popular natural remedy for an upset stomach and indigestion. To make it steep a teaspoon of fresh or dried leaves in a cup of boiling water for 15 minutes, cover and then drink slowly. Alternatively, there are organic parsley teabags available. In an unusual parsley benefit, more for those around you, eating the fresh herb helps reduce body odor and flatulence problems by detoxifying your body from the inside with it’s chlorophyll and potent volatile oils. And, as many people know, it is also an excellent breath freshener, able to neutralize even the strongest cases of bad breath caused by garlic, onions or other high sulfur foods. If you ever need to freshen your breath after a meal at a restaurant, ask for extra parsley. It is a great natural cure for halitosis. Fresh parsley is a simple and nutritious food to add to a variety of meals such as salads, soups, pesto, pasta and rice dishes, stir fries and sandwiches. Eating it is also a great way to get many of the important nutrients for healthy skin and hair into your diet. Parsley is rich in vitamin C which is needed for collagen production, clearing up blemishes and maintaining good skin tone. The very high levels of vitamin K in it may also help improve skin’s elasticity and appearance as well as speeding up wound healing and reducing redness. Beta-carotene in parsley can be converted to vitamin A for skin maintenance and repair (a dry and flaky forehead and cheeks are a common symptom of mild vitamin A deficiency), or act as a powerful antioxidant to protect your skin cells from free radical damage. . Eating parsley is a great way to get more minerals into your diet too. There are good levels of calcium, potassium, manganese and iron in parsley and its copper and zinc content are especially relevant for maintaining healthy skin and alleviating blemishes. If you have a good juicer then juicing it would be an extremely effective way to get a concentrated amount of all of its minerals, vitamins and other beneficial compounds into your body. There is another way more direct method to use the herb to improve your skin’s appearance. While eating it provides the nutrition for healthy skin internally, the homemade parsley face mask here is often a quick and effective natural remedy to reduce dark spots, discolored skin and acne problems. Having parsley in your meals regularly can help balance out excessive sebum secretions in oily or inflamed skin. The volatile oils in it can also have an antibacterial effect on pores, potentially leading to less acne outbreaks. Parsley’s high levels of vitamin C provides antioxidant protection for skin cells. This can reduce the irritations that can lead to pimples. Vitamin C is also known to speed up skin healing, so will help reduce the time it takes for blemishes to clear. The zinc found in parsley is a mineral well known for its beneficial effects on acne. Zinc is involved in inflammation control, wound healing and skin cell maintenance and regeneration. A lot of people with acne problems report positive results when they add more zinc to their diet. This powerful green herb is also one of the best food sources of vitamin K. Vitamin K speeds up skin healing, reduces redness and may help diminish acne blemishes. It is also involved in regulating the body’s inflammatory response. Some people have success with topical vitamin K treatments for reducing skin redness and clearing up acne scars, but getting good amounts of this vital yet hard to get nutrient internally by eating greens like parsley regularly could be just as important for maintaining healthy skin. The volatile oils in parsley, eugenol in particular, have antibacterial and antifungal properties and may help to disinfect pores, fight infections and prevent acne as well. Parsley has been traditionally used as a hair tonic in an infusion massaged directly into the scalp to stimulate hair growth. It is also believed to help promote hair color (perhaps due to its copper content) and shine, both when used topically and in large amounts in the diet. On a more scientific note, researchers have recently found that the antioxidant flavonoid apigenin in the herb stimulates hair growth through the down regulation of the TGF-beta1 gene. Hair growth is closely linked to the level of overall nutrition we get into our diets on a regular basis. Being such a nutritious food, parsley addresses a number of nutritional deficiencies that can lead to hair loss and weak or lackluster hair in general. It’s also very important for both your hair and your skin to make sure you’re are getting enough essential fatty acids. Black currant seed oil with it’s high levels of gamma linoleic acid and omega-3s is a great choice here. Parsley is a green superfood so rich in vitamins, minerals, antioxidants and other nutrients that eating it is like using a multivitamin supplement – only one that actually works. The nutrition in this herb is much more easily assimilated than in engineered multivitamins and many people who start using it regularly in their diet with attest to the many health benefits of parsley. It is a good source of provitamin A beta-carotene, with one cup containing around 100% of the standard RDA (though you’d really want to get more than that for vitamin A’s benefits on your immune system, for healthy skin and vision, protection from infection and much more). It is very high in vitamin C, containing far more than most well known sources like oranges and other citrus fruit (though these are admittedly much easier to eat in large quantities). Vitamin C from natural sources like parsley is a potent antioxidant that protects the cells in our bodies from dangerous free radical damage. The little green herb that so many people push aside on their dinner plate is also one of, if not the best plant based source of the very important vitamin K that so many are deficient in. This vitamin is essential for blood clotting, healthy bones and preventing the calcification of blood vessels that can lead to cardiovascular disease. Recent research studies indicate a good intake of vitamin K in our diets helps protect against heart disease, osteoporosis, Alzheimer’s and some forms of cancer. Parsley is also a source of vitamin E and several B vitamins, particularly folate that is needed for proper DNA synthesis and cardiovascular health. Parsley is a good source of three of the major minerals — calcium, magnesium and potassium. Magnesium is especially important as many people in the USA and across the Western world have a magnesium deficiency. Calcium and magnesium metabolism are closely related, so there is little value in having large amounts of calcium in supplements without adequate magnesium as well. Parsley is especially rich in the mineral iron. It also contains good levels of manganese and copper. These three minerals are necessary for building healthy blood cells and the herb is known as one of the best blood builders and cleansers available. While not a mineral, the good levels of chlorophyll in parsley is also very valuable for maintaining healthy blood. Phosphorus, sodium, chloride, boron and zinc are also present, making it a good all round mineral source. Alongside the already mentioned beta-carotene, vitamin C, vitamin E and zinc, parsley also contains a variety of beneficial flavonoids with antioxidant properties, including quercetin, luteolin, apigenin and chrysoeriol. Additionally, it is also a good source of the carotenoids lutein and zeaxanthin for healthy vision and protection against eye diseases like age related macular degeneration and cataracts. 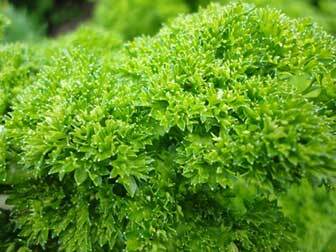 Parsley’s volatile oils include myristicin, eugenol, limonene and alpha-thujene. Volatile oils are potent compounds that can have bioactive effects even in very small doses. Research on myristicin has shown it has anti-inflammatory and antibacterial properties and animal studies suggest it may inhibit cancerous tumor formation. Myristicin may also increase the action of our bodies most important detoxifying antioxidant – glutathione. Eugenol has been shown to reduce blood sugar levels and may have a future role in diabetes treatment. Eugenol is also a strong anti-inflammatory, antibacterial and antimicrobial that may help control bad bacteria in the digestive system and even treat debilitating candida overgrowth. Parsley oil is a concentrated source of these volatile oils and is often taken with garlic oil for a potent immunity booster (the way the herb eliminates the garlic odor probably also has a lot to do with the popularity of this combination). The various valuable antioxidants in both Italian and curly parsley, such as vitamin C, vitamin E, beta-carotene, quercetin and other flavonoids help prevent oxidation in your cardiovascular system by neutralizing free radicals, thus potentially reducing your risk of heart disease. The polyacetylene compound falcarinol found in parsley is believed to have both anti-inflammatory and anti-platelet-aggregatory properties for preventing heart disease and stroke. Additionally, studies show myristicin, a major volatile oil in fresh parsley, may increase the activity of the master antioxidant glutathione in your body. If it does, this could have a protective effect against a wide variety of inflammatory diseases, including cardiovascular disease. The herb is also a good source of folate, which is involved in neutralizing homocysteine molecules in the blood stream that can damage blood vessels, eventually leading to heart attacks and strokes. While difficult to prove conclusively (and there’s no incentive since you can’t patent a herb), there’s a strong case to be made for the many potential health benefits of parsley in preventing cardiovascular disease. As healthy a food as parsley is, there are also a couple of important warnings to be aware of next in Parsley, Pregnancy and Other Precautions, including one for people being treated with blood thinning medications. Parsley is a good source of minerals such as calcium, magnesium, fluoride and boron which help protect against further bone thinning in the case of osteoporosis. Low levels of vitamin K in the diet has also been linked to developing osteoporosis. Parsley is extremely rich in this important but hard to get nutrient. Parsley is a potent source of antioxidants such as vitamin C and beta-carotene and contains a wide variety of potentially anti-inflammatory nutrients which may help reduce the symptoms of arthritis. Eating the herb regularly is also said to speed up the excretion of uric acid, a substance that can increase joint stiffness and pain for arthritis sufferers. A teaspoon of parsley made into a tea in a cup of boiling water is often recommended as a useful arthritis treatment. Fresh parsley is probably better, though dried organic flakes are also reported to be effective for many people. Parsley has a variety of nutrients to protect us against developing cancer. It is rich in antioxidants like vitamin C, beta-carotene and quercetin, but also contains less well known flavonoids like apigenin, luteolin and chrysoeriol. Apigenin research studies have associated it with a decreased risk of pancreatic cancer, leukemia, cervical and ovarian cancer. Apigenin has also been shown to interfere with cancer cell proliferation, exhibiting strong anti-tumor properties. The flavonoid luteolin found in parsley has a chemopreventive (anti-cancer) action by reducing the effects of carcinogenic compounds called heterocyclic amines and polycyclic aromatic hydrocarbons found in foods like cooked meat. Research has also shown luteolin to have an anti-proliferative effect against hormonal cancers such as prostate, thyroid and breast cancer. A third flavonoid, chrysoeriol, has also been studied for its potential anti-cancer benefits, particularly with regards to preventing breast cancer. Parsley benefits also includes high levels of polyacetylenes such as falcarinol, which is believed to inhibit the proliferation of cancer cells and be strongly cytotoxic (cancer killing). Chlorophyll in this green superfood can also help deactivate harmful carcinogens that promote tumours. Additionally, vitamin K, one of the real standouts in parsley nutrition, may also have a role to play in cancer prevention. Certain volatile oils in the herb are considered chemopreventive. Myristicin in particular, which has been found to be a high percentage of the volatile oil in parsley, has been studied for its ability to increase the activity of our body’s major detoxifier glutathione. Patients with cancer and many other serious diseases are usually found to have reduced glutathione levels. Glutathione is our bodies premiere antioxidant. If the myristicin found in the herb can actually increase its action, parsley benefits may apply not just for preventing cancer, but for a wide variety of other diseases as well. There are so many parsley health benefits it’s surely worth eating it should you find it on the side of your plate. Better still, plant it in your garden if you have one or grow a few pot plants on your windowsill and try to use it whenever you can in meals. If you have a good supply of fresh parsley already and a masticating juicer or a powerful blender, coming up next is another extremely beneficial way to use it in 2 special parsley recipes for kidney cleansing and liver detoxification. Would you recommend eating dried parsley as opposed to fresh? Fresh is better but dried parsley is a healthy addition to meals. I keep a jar of washed chopped parsley in my freezer and I use some in almost every meal. It is very convenient and I believe is closer to fresh than the dried version. That’s a good idea and yes frozen parsley is much better than dried parsley. How much and often can you chew parsley? Can you swallow it after chewing? How long before results are seen? Thanks for the work on health you provide for us. Parsley is often recommended to treat fibroids, both added liberally to meals and in the tea recommended in the article.